Known for their aromatic high-altitude teas the world over, the Nilgiri Hills are rarely recognized as the fruit and vegetable basket of South India. More than half of the acreage under cultivation in these Blue Hills is covered with beetroots, cabbage, potatoes, along with indigenous millets and greens. Thus, many farmers are switching to the centuries old ways of natural farming. Join in a week-long hands-on cooking course, where Indian food will be demystified and simplified for you. You will have the opportunity to learn cooking authentic, delicious, and healthy Indian meals with organic ingredients using the rays of the sun. Nestled in a lush tea garden, Raven’s Nest is a guest house surrounded by silver oak trees and flowering plants. The flower lined lawns are the perfect place to breathe in the pristine Nilgiri Hills air, while the dappled shade of the deck is a cozy corner to curl up with a book. Its recycled teak wood floors and doors have stories to tell of faraway lands. The three-bedroom with orthopedic mattresses will help rid you off your big city stress. It is five kilometers from Kotagiri town and two hours from Coimbatore airport (CJB). The salubrious weather at 6000 feet make Raven’s Nest a year-round destination. They have three rooms for twin sharing, which can be converted to double beds. Each room has a desk, a TV connected to a dish and a color-coordinated bathroom with large mirrors attached to it. In case the cold weather gets to you, there are wall mounted heaters in all the bedrooms and bathrooms. An in-house generator maintains continuity of all services, during power outages. You will arrive either in the morning or noon at Coimbatore International Airport (CJB), where you will be picked up and driven up to the Nilgiri biosphere through forests, between coffee and tea plantations. You will be served lunch or a light tea, followed by a talk on the Nilgiris. That night, you will be served with dinner, which will be a mix of some of the many regional Indian cuisines. Those who are game to get up at 07:00, can join the yoga class and stretch out on the mats in the garden, after a cup of tea, South Indian filter coffee, or just plain coffee. If you would like to sleep in until breakfast, you can do so. Your breakfast will be a mix of South Indian dishes with cereals, milk, eggs, and toast with organic preserves at 08:00. Then you will be driven to Ooty 09:00, where a qualified guide will take you on a heritage walk to see the historical buildings left behind by the British. After the two-hour walk, you will have lunch at The Place to Bee, a café serving organic Indian, continental food, and pizza. You will come back by 15:30 and at 16:30, you will begin your first cooking class. After yoga and breakfast, at 09:00, you will be shown how the solar cooker works and how to load it for the meal you will cook later in the afternoon. You will drive to an organic tea garden, where you will learn about the cultivation and processing of organic tea, while partaking in a tea tasting. This will be followed by a Malyali or Parsi lunch. Another option is to go to the Culinarium for a light western meal. By 15:30, you will get back and start your second cooking class at 16:30. You will start your third class at 07:30 and will be shown how to make the ever popular South Indian breakfast. Upuma or poha - a spiced up cream of wheat dish, which are no longer staples in the South of India, but are found across the country at breakfast, as they are a healthier option to the traditional deep friend puris and pan fried parantha. After brunch, at 10:30, you will drive to Ooty, where you take the heritage train to Coonoor. Here you can shop for tea, spices, and antiques. You will have dinner on your own at either the Taj or McIver (Taste Organic India can make reservations for you). After dinner, you will head back. You will head to the Military township of Wellington, where you will visit an Ayurvedic center and be served a Satvik meal, which is a very light, non-oily, and non-spicy. Or, you can visit the Last Forest, which is an NGO, where you learn about the Nilgiri biosphere, the tribals, and their products. After a light lunch and maybe a nap, you start will start your fourth cooking class at 16:30. After breakfast, you will go for a two-hour walk to the Longwood forest or if you prefer to stay home, you may chill out on the deck and have a light lunch at home, which is on the house. You can also go on your own shopping in Coonoor or Ooty. But, just remember to be back by 16:30 for your fifth class. This is the last class learning food from the Nilgiris. You leave after or before breakfast. Vidya is a journalist, who survived cancer and now teaches journalism. She was inspired to eat more organically grown foods, after attending a course conducted by Organic Tuscany in Italy. She then, decided to combine her passion for cooking and teaching skills, and run a cooking class. Nimmi is a certified nutritionist, who heads The Earth Trust, an organic bio dynamic farm. She is Taste Organic India's go-to girl from Coonoor, who loves meeting people, trekking, reading, and animals, especially dogs. She is excited about working on this interesting venture and introducing The Nilgiris to people from far and wide. Anita is the tour guide, who rattles of historical facts and Nilgiri trivia, effortless and endlessly. If you don’t watch out, you may find your two-hour heritage walk extended to a whole day one. This holiday will take place in Nilgiris. The word Nilgiris means Blue Mountain in Sanskrit; possibly derived from the Strobilanthes Kunthiana or Neelakurinji flowers growing here, which bloom every 12 years and spreading a blue hue across the hills. These hills are situated in the western part of Tamil Nadu and are a part of the Western Ghats range running along the coast of peninsula India from Maharashtra to Kerala. There are 24 peaks above 2,000 meters (6,600 feet) making up the southwestern edge of the Deccan plateau. To the uninitiated, Indian foods are deep fried samosas or the tandoori tikka masalas. But there is more to Indian food than that. With 29 states, literally a Europe under one flag, spread over 3.2 million square kilometers, India’s diverse soil type and climate determine the kind of agriculture practiced and the food eaten. While in the people in the northern wheat belt eat chapattis or unleavened bread, rice is the staple in the South Indian and East Indian cuisine., rice remains the staple in the South Indian and East Indian cuisine. Religious, cultural and ethnic affiliations also determined the diverse cuisine. The caste system determined, who ate what and when, which resulted in the development of vegetarianism and a rich variety of dishes. While those who were permitted to eat meats, created their own cuisine. Then, there are the spices. The spice trade, often cited as the primary catalyst for Europe’s Age of Discovery, was sourced from India, where it grew in abundance in the tropical climate. When these spices are added to the foods, they changed the flavor from ordinary to extraordinary. India as a result, was a country to be invaded and conquered for its spices and other wealth. The occupiers brought their agriculture products and so, the British brought tea from China, whilst the Portuguese brought potatoes, chilies along with avocados, and they took cashew and jackfruit to propagate in their other colonies. The cuisine continues to evolve with the growth and liberalization of the economy, which permitted the import of food products legally, forbidden until the early 1990s. Today Maggi noodles have become an integral part of the Indian diet! Indian cuisine is often considered complicated, difficult, and oily, which is not always true. Making a flaky croissant or risotto of the right consistency requires the same amount of patience and is just as time consuming. The food that Taste Organic India teaches you to cook is authentic and simplified. Some of the menus can be dished out in a little over in an hour. With a vast variety to choose from, their menus will take you on a trip across the length and breadth of this diverse nation. They make you taste flavors, which are unique and inhale aromas that you can never forget. Also, they are much lower in calories than what is dished out in Indian restaurants around the world. Organic farming methods in India date back to 2500 BC with the dawn of civilization, along the Indus River in Harappa and Mohan-jo-daro. Farmers cultivated land and raised crops with the use of organic waste, from crops, animals, other farm, and aquatic by-products, along with other biological materials to release nutrients to crops. However, this method of cultivation was put aside during green revolution of the 1950s and 60s, when a starving India had to turn to western techniques to feed its exploding population. High-yielding hybrid seeds, increased use of inorganic fertilizers, pesticides, and improved irrigation techniques helped increase agriculture making India self-sufficient in food grains. The flip side was that the overuse of chemicals gradually destroyed the natural abilities of the land and agriculture yields decreased. As petrol, which is the base of the chemicals, had to be imported, the Indian economy suffered greatly, as they parted with their precious foreign exchange. Agriculture scientists have realized that a natural balance has to be maintained for the existence of life and property. The agrochemicals produced from non-renewable fossil fuel will soon be harder to obtain. And so, there has been a very slow, but steady move towards organic farming. Inorganically grown fruits and vegetables, if not cleaned thoroughly before consumption, have long been suspect of causing cancer and a host of other diseases. Along with this, the fertilizers, pesticides, and insecticides enter the soil and stay there for decades contaminating the ground water. Eating organically grown products is not only just good for your health, but also for the soil. Something you need to preserve for posterity. The Nilgiris are blessed with six months of strong sunshine, making it perfect to cook food through solar energy. For the past few years, Taste Organic India at Raven’s Nest has been cooking their lentils and rice, and even baking cakes, in a very simple solar cooker. With the sun free, it has been a great way to cut down on their LPG bills and make use of an unlimited natural resource. Cooking the solar way is a healthier option to gas, fire, and the microwave, because we use the natural power of the sun’s energy. Solar cooking done outdoors prevents the kitchen from heating up. Best of all, this method preserves more of the natural nutrients of the foods, as they are cooked slowly and at lower temperatures. Don’t take their word for it, come taste the banana bread and carrot cake that they bake in their very inexpensive and unsophisticated solar box. While you cannot do away completely with other methods of cooking, you can reduce your dependence on non-renewable energy sources. Food cooked using the solar cooker method is cooked by the sun's UV rays that are converted to heat energy. This energy is then retained in the pot and food by the lid. This is pretty much the same way on how a greenhouse retains heat. An effective solar cooker will use the energy of the sun to heat a cooking vessel and efficiently retain the energy (heat) for maximum cooking effectiveness. Solar energy does take longer to cook than the traditional methods, but look at it as a slow cooker, with one big advantage. The even temperature of the solar oven prevents burning, so you don’t need to stir your food while it’s cooking. When was the last time you didn’t stick a knife into the cake to check, if it was done. As there is no movement of air in a solar cooker, the food stays moist, tender and flavorful. It is also healthier. Temperatures in a solar oven rise slowly and evenly, allowing complex carbohydrates time of break down into simple sugars, emanating subtle natural flavors. Coonoor is a Taluk and a municipality in the Nilgiris district in the state of Tamil Nadu, India. It is known for its production of Nilgiri tea. Coonoor is located at an altitude of 1,850 meters above sea level and is the second largest hill station in the Nilgiri hills, after Ooty. It is an ideal base for a number of trekking expeditions leading into the Nilgiris. The nearest airport is Coimbatore International Airport (CJB), which is about 79 kilometers from Coonoor town. As of 2011, the town had a population of 45,494. Kotagiri is a panchayat town in The Nilgiris District in the Indian state of Tamil Nadu. It is situated at an elevation of around 1793 meters above sea level and is one of the three popular hill stations located in the Nilgiris. It has an average elevation of 1793 meters (5882 feet). The region is famous for its evergreen vegetation. Tea, eucalyptus, and wintergreen grow well in this area. The soil is also ideal for the cultivation of temperate fruits and vegetables with a lot of local farmers turning to brussels sprout, cabbages, carrots, and mushroom cultivation among other crops. Udhagamandalam, and abbreviated as Udhagai and Ooty is a town and municipality in the Indian state of Tamil Nadu. It is located 80 kilometers north of Coimbatore and is the capital of the Nilgiris district. It is a popular hill station located in the Nilgiri Hills. Originally occupied by the Toda, the area came under the rule of the East India Company, at the end of the 18th century. The economy is based on tourism and agriculture, along with manufacture of medicines and photographic film. The town is connected by the Nilgiri ghat roads and Nilgiri Mountain Railway. Its natural beauty attracts tourists and it is a popular summer destination. As of 2011, the town had a population of 88,430. Raven’s Nest is a two hour drive from Coimbatore International Airport (CJB), which is connected directly to Singapore (Silk Air), Sharjah (Air Arabia), and all the major Indian cities (Indigo, Jet, Air India, Spice Jet). Transfer from and to the airport is included. The organizer will pick you up from the airport. Airport: Coimbatore International Airport Airport transfer included: Coimbatore International Airport No additional charges. You can request this in the next step. 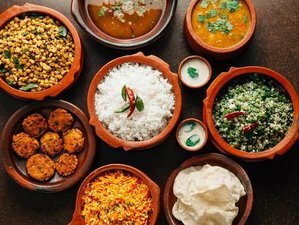 Taste Organic India offers Indian culinary and cultural experience, along with tea tasting and organic farming activities in the Nilgiri Hills of South India.